ST. LOUIS, April 12, 2019 – Dent Wizard International, the largest provider of automotive reconditioning services and vehicle protection products in North America, recently introduced Evolution, Vehicle Protection by Dent Wizard, a branding of its F&I business unit. ST. LOUIS, July 18, 2018 – Dent Wizard International, the largest provider of automotive reconditioning services and related products in North America, recently acquired Image Auto, LLC, a provider of auto reconditioning and wheel repair services in the Central and Western New York and Pennsylvania areas. The acquisition finalized June 8, 2018. ST. LOUIS, July 11, 2018 – Dent Wizard International, the largest provider of automotive reconditioning services and related products in North America, recently hired Jim Powers as chief financial officer, effective July 2. He will report to Dent Wizard CEO Mike Black. 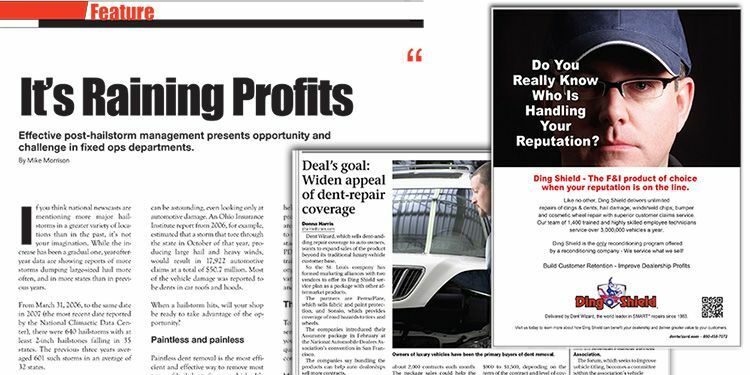 ST. LOUIS, May 9, 2018 – Dent Wizard’s continued expansion in the dealership market and growth in the key duplication segment boosted revenue in 2017. Terry Koebbe, who became chairman in April when Michael Black was promoted to president and CEO, said the automotive reconditioning company only has a 7 percent share in the dealer market so there is more room to expand. Dent Wizard International, the largest provider of automotive reconditioning services and related products in North America, recently announced that Addison Thomas was promoted to chief operating officer, and Doug Grill to Thomas’ previous position as regional vice president of Dent Wizard’s MidSouth region. These promotions come after Mike Black was promoted to chief executive officer, effective April 1. ST. LOUIS, April 5, 2018 – Dent Wizard International, the largest provider of automotive reconditioning services and related products in North America, has promoted Mike Black to chief executive officer, effective April 1. Black most recently served as president and COO. As CEO, he will lead the company and continue driving profitable growth, while having responsibility for all areas of the business. St. Louis, January 10, 2018 – Dent Wizard International, the global leader in automotive reconditioning and SMART (Small to Medium Area Repair Techniques) repairs, recently introduced new F&I programs that expand beyond the appearance protection menu offerings the company is known for. ST. LOUIS, August 9, 2017 – Dent Wizard International, the global leader in automotive reconditioning and SMART (Small to Medium Area Repair Techniques) repairs, was recently named a “Top Workplace” by the St. Louis Post-Dispatch. The annual list is calculated and compiled by the Post-Dispatch, a major metro daily newspaper in the U.S., in conjunction with WorkplaceDynamics, an employee research and consulting firm based in Exton, Pa.
Dent Wizard was recently recognized as one of the Power 300 companies by Auto Remarketing Magazine. In the interview with the magazine that highlights major players in the used car and remarketing world, Mike Black, President and COO of Dent Wizard International, shared the company’s challenge and digitization strategy to maintain and grow influence in the automotive industry. Aston Martin of New England has added Dent Wizard’s Ding Shield Advantage program to its extended service contract. Aston Martin of New England & Lotus Motorsports, Inc. now offers their customers wheel and rim insurance through Dent Wizard’s Ding Shield Advantage program. Dent Wizard International, the global leader in automotive reconditioning and SMART (Small to Medium Area Repair Techniques) repairs, recently promoted Matt Boyd to the position of director of operations – Canada. Boyd previously served as the company’s national sales manager in Canada. Dent Wizard International, the global leader in automotive reconditioning and SMART (Small to Medium Area Repair Techniques) repairs, recently promoted Mike Black to president, in addition to his current position as chief operating officer. Black replaces Terry Koebbe as president. Koebbe retains his position as chief executive officer. Dent Wizard International, the global leader in automotive reconditioning and SMART (Small to Medium Area Repair Techniques) repairs, was recently featured in the St. Louis Business Journal's list of 2017 Top 150 Privately Held Companies in St. Louis. Dent Wizard International, the global leader in automotive reconditioning and SMART (Small to Medium Area Repair Techniques) repairs, recently hired Jim Townsend as vice president of information technology. Technicians from Dent Wizard International, the global leader in automotive reconditioning and SMART (Small to Medium Area Repair Techniques) repairs, earned first and second place honors in the annual PDR (Paintless Dent Removal) Dent Olympics competition at the 2017 International Mobile Tech Expo, held January 19-21 in Orlando, Fl. Dent Wizard International, the global leader in automotive reconditioning and SMART (Small to Medium Area Repair Techniques) repairs and F&I appearance plans, recently moved its F&I division, customer service and claims management team to a new facility near the company’s St. Louis headquarters. Dent Wizard International, the global leader in automotive reconditioning and SMART (Small to Medium Area Repair Techniques) repairs, recently hired Ryan Briggs to the newly-created position of vice president of customer development. Dent Wizard International, the global leader in automotive reconditioning and SMART (Small to Medium Area Repair Techniques) repairs, recently promoted Eric Walker to regional finance director for the South Region of the company’s F&I business, which comprises the states of Arkansas, Kentucky, Louisiana, Mississippi, Oklahoma, Tennessee and Texas. Dent Wizard International, the global leader in automotive reconditioning and SMART (Small to Medium Area Repair Techniques) repairs, recently appointed Scott Goodwin as vice president of OEM services for Dent Wizard’s KhS (Know How Systems) business unit, which provides high-volume automotive repair, claims management, and ppraisal services to leading automotive OEMs and insurers in the U.S., Canada and Mexico. Dent Wizard International, the global leader in automotive reconditioning and SMART (Small to Medium Area Repair Techniques) repairs, recently appointed Paul Spears as regional operations director for the company’s Mid-South Region. Dent Wizard International, the global leader in automotive reconditioning and SMART (Small to Medium Area Repair Techniques) repairs, recently promoted Matt Trudeau to the position of Director of National Sales for Dent Wizard’s Finance & Insurance programs. Dent Wizard International Corporation (“Dent Wizard”), the global leader in automotive reconditioning and SMART (Small to Medium Area Repair Techniques) repairs, today announced its acquisition of Know How Systems Global (“KhS”), a St. Louis-based provider of high-volume automotive services and repairs to leading automotive OEMs and insurers. Dent Wizard International, the global leader in automotive reconditioning using SMART (Small to Medium Area Repair Techniques) repairs, recently added Scott Stoner as MidSouth Regional Business Development Manager. Dent Wizard International, the global leader in automotive reconditioning and SMART (Small to Medium Area Repair Techniques) repairs, recently appointed Ben Ashby as project manager for the company’s growing wheel remanufacturing business. St. Louis automotive alloy wheel repair operation provides an overnight repair and delivery service for the region’s auto dealerships, body shops, and wheel retailers. Hartford automotive alloy wheel repair operation provides an overnight repair and delivery service for the region’s auto dealerships, body shops, and wheel retailers. Ready Line Express is a rental agency’s consolidated source for SMART repairs, including PDR, minor paint, bumper repair, wheel repair and interior repair and helps keep vehicles in service or in sell-ready condition. The two previously served as Regional Hail Managers: Allen covering North Carolina and South Carolina; and Whitney covering Arizona, Colorado, New Mexico, Nevada and Utah. Dent Wizard Technician Resource Manager Randy Sheridan was live on Fox 2 News in St. Louis on April 8 from Dent Wizard’s corporate headquarters in Bridgeton, discussing how to repair hail damaged vehicles following a recent hail storm. Sheridan talked about Dent Wizard’s hail repair process, and how Dent Wizard can work with your insurance company to get you the best possible deal and back on the road quickly following a hail storm. ST. LOUIS – During the 2015 National Automotive Dealers Association (NADA) Conference held in San Francisco Jan. 22-25 2015, Dent Wizard Northeast Regional Business Development Manager Tom Duffy appeared on Jeff Cowan’s Service Drive segment, to discuss Dent Wizard’s turnkey dealer service offerings. Duffy spoke about Service Drive, Frontline Fast and MINT cosmetic reconditioning services, and how dealers can benefit from offering these programs at their dealerships. ST. LOUIS – Cohen will manage and expand Dent Wizard’s business in Arkansas, Colorado, Kansas, Louisiana, Mississippi, Missouri, New Mexico, Oklahoma, Texas and Utah. Cohen will work from her office in Chesterfield, Mo. She will report to Addison Thomas, Dent Wizard’s Regional Vice President of Midsouth. ST. LOUIS – Stone will work with the Mint team to develop additional sales opportunities and increase the number of Mint locations. She will report to Lindsey Bird, Dent Wizard’s vice president of aftersales. St. LOUIS – With Smart Claims, users can file a Ding Shield service plan claim when and where they want, using any mobile device. The Smart Claims app’s intuitive design features a function that lets users identify damaged areas using pictures and a menu of options. CARY, N.C. – Do the math on this one: Bourne's Auto Center is stocking less and selling more. ST. LOUIS - Now, Co-Auto dealership members have a few new options when selling service plans to customers. ST. LOUIS - Dent Wizard International recently named a former rental car company executive with more than two decades of experience to be its new director of business development for its rental business. Dent Wizard International, a global leader in automotive reconditioning and SMART (Small to Medium Area Repair Techniques) repairs, recently added Eric Walker as regional business development manager, covering the states of North Carolina, South Carolina, Tennessee, Kentucky and Southern Virginia. Dent Wizard International introduced MINT, a dealership-based cosmetic reconditioning retail program. It allows high-line dealers — even those with limited space — to capture revenues that have previously driven out the door, according to company officials. Considering a Cosmetic Reconditioning Program? Dealerships today are looking for every opportunity to capture revenue whenever a customer – new or existing – visits the dealership. Precious square footage previously dedicated only to showroom floor models is now being used for selling anything from branded apparel to customized aftermarket products, while creating a welcoming atmosphere for customers that encourages them to stay awhile. Once reserved for highline dealerships only, such strategies are now working well at dealerships selling mid-priced cars and at multi-franchise locations. Brad Pritz doesn't always hear the story. Dent Wizard International has been the leader in the development of PDR (Paintless Dent Removal) technology and service since its establishment in 1983, and today is North America's leading provider of S.M.A.R.T. (Small to Medium Area Repair Techniques) repairs, including paint, wheel and interior repairs.